"Whether you are an existing online eBay seller or just thinking of starting out, selling stuff from home or your business may be small or large, home-based or on the high street you can be part of eBay. In these DVD's I show you step by step how to make your business work and show you how to avoid the costly mistakes that can make the difference between success and failure. I have been involved with online retailing for many years, providing 'How To' seminars, coaching and training workshops for dozens of online retail businesses and new start up entrepreneurs. Based on my experience of building and running a fast-growing, multi-million pound business, I will reveal the secrets, tried and tested formulae's for making money - 24/7. My own business sources, promotes online and ships worldwide. No previous experience is required; I will go through the easy to follow guidelines. You will have access to the secret hints and tips that only the professional sellers usually have: • How to get started • How to write great listings • How to take great photographs • How to ship your items to your buyer • How to get your listing found by eager buyers • How to turn your opportunity into a great business How do I know you will get such great information that will transform the way you can sell things on eBay? I have a very successful business with excellent customer feedback. I will be sharing this knowledge with you helping to double, triple or even quadruple the number of items you sell. "Whether you are an existing online eBay seller or just thinking of starting out, selling stuff from home or your business may be small or large, home-based or on the high street you can be part of eBay. In this DVD I show you step by step how to make your business work and show you how to avoid the costly mistakes that can make the difference between success and failure. " "• How to get started • How to write great listings • How to take great photographs • How to ship your items to your buyer • How to get your listing found by eager buyers • How to turn your opportunity into a great business "
"I have been involved with online retailing for many years, providing 'How To' seminars, coaching and training workshops for dozens of online retail businesses and new start up entrepreneurs. Based on my experience of building and running a fast-growing, multi-million pound business, I will reveal the secrets, tried and tested formulae's for making money - 24/7. My own business sources, promotes online and ships worldwide. " No previous experience is required; I will go through the easy to follow guidelines. 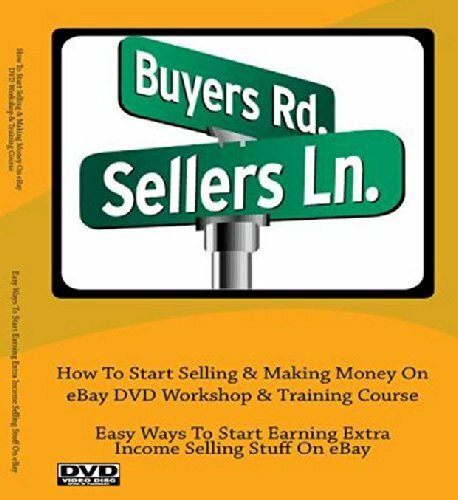 You will have access to the secret hints and tips that only the professional sellers usually have: How do I know you will get such great information that will transform the way you can sell things on eBay? I have a very successful business with excellent customer feedback. I will be sharing this knowledge with you helping to double, triple or even quadruple the number of items you sell. Be the first to review “How To Start Selling & Making Money On eBay DVD Workshop & Training Course ; Easy Ways To Start Earning Extra Income Selling Stuff On eBay” Click here to cancel reply.